PROSTEP is the leading specialist for the digital transformation of your business processes. We use the original 3D PDF technology from Adobe Systems for the paperless or drawing-free provision of all kinds of information. Merge 3D models from any CAD system, 2D documents of any kind and metadata from your PLM and ERP systems in intelligent 3D PDF documents that can be viewed with Adobe Reader and which can even be used for long-term archiving. You benefit from best practices and our extensive process know-how, which have been incorporated in our 3D PDF-based solutions in the form of templates. We automate your business processes, from preparing bids to creating spare parts catalogs, using a uniform, tried-and-tested technology. We combine your models, drawings, BOMs and other 2D documents in 3D PDF containers – and in a format suitable for long-term archiving. You can view the 3D PDF documents with Adobe Reader, which means that there is no need to install any other viewers at your company or your partners' companies. We protect the content of the 3D PDF documents that you send to your suppliers or customers – even after they have been sent – using secure digital rights management. We create intelligent 3D PDF forms for you so that you can automatically insert data from your backend systems or automatically read out data that has already been entered. You can animate 3D models after embedding them in 3D PDF documents – to better illustrate assembly or service workflows for example. We help you coordinate with partners and suppliers by making it possible to annotate 3D PDF documents and integrate original data. We convert 3D data from all leading CAD systems including the product structures and appended PMI (product and manufacturing information). Use our products to make more of your digital data. Based on the original technology from Adobe, PROSTEP develops 3D PDF solutions for the digitalization and automation of various business processes from requests for quotes to drawing-free manufacturing and 3D assembly planning to spare parts management. Our 3D PDF specialists are not only familiar with the strengths of 3D PDF technology but also know how to best integrate this technology in your existing IT and process landscape. We automate your business processes and help you get greater value from your digital data. PDF Generator 3D is PROSTEP's comprehensive server solution for the automatic generation of 3D PDF documents using intelligent forms to integrate data from backend systems and transfer data to these systems. When creating 3D PDF documents, the Reader Extension module automatically activates additional functions for copying, annotating and measuring embedded 3D models in Adobe Reader. Adobe Reader is the viewer used to display all the content. The 3D PDF Reader for iOS App even allows 3D PDF documents to be viewed and edited on mobile devices like iPhones and iPads. PDF Generator 3D also makes it possible to merge different contents in PDF containers and protect them with a password. The Rights Management module allows a sophisticated rights concept to be implemented and, for example, the period of use to be limited. The software supports the integration of semantic PMI (product and manufacturing information) for further use and includes functions for comparing the geometry of 3D models from the same and from different CAD systems. PDF Generator 3D uses key components of Adobe AEM Forms to define business processes and call web services, databases and LDAP directories, which allows its seamless integration in AEM Forms implementations. PLM connectors can be used to integrate PDF Generator 3D in an ERP and PLM landscape and connect it to the data exchange solution OpenDXM GlobalX in order to automate complex document workflows. 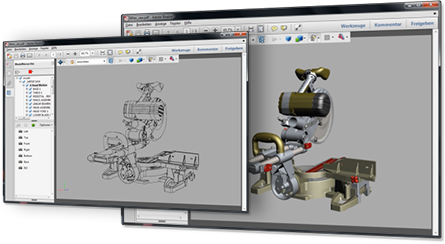 Tetra4D Automate is an easy-to-implement server solution for automatically generating interactive 3D PDF documents enriched with PMI (product and manufacturing information) and other information. In combination with Adobe Acrobat Pro, Tetra4D Automate makes it possible to create templates for product visualization, design data release, change notifications, spare parts catalogs, etc., which are automatically filled with the appropriate data. The software is very easy to use, adapt and integrate. For more complex requirements in terms of automation and process integration, however, we recommend using PROSTEP's PDF Generator 3D. Tetra4D Converter is the world's leading client solution for converting native 3D CAD data and embedding it in interactive 3D PDF documents that can be viewed with Adobe Reader. 3D data from the latest versions of Autodesk Inventor, CATIA, PTC Creo, Siemens NX, SolidWorks and other leading CAD systems is converted directly into the tessellated U3D format or the precise PRC format. Tetra4D Converter also converts BREP geometry embedded in PRC format back into neutral file formats such as STEP, IGES, STL, Parasolid or ACIS for use in downstream CAx systems. Tetra4D Enrich is a powerful client application that enables interactive 3D PDF documents to be created easily and requires no programming expertise on the part of the user. Like an app, the 3D PDF documents generated with Tetra4D Enrich provide all the data required by all types of complex workflows for digitalizing business processes. As with all other 3D PDF documents, the 3D PDFs that are interactively enriched with additional information can also be viewed with Adobe Reader. 3D PDF Pro is PROSTEP's powerful client solution for animating the 3D models embedded in 3D PDF documents. The software offers options for creating step-by-step instructions and integrating requirements, which means that the 3D animations can be used in a wide variety of application scenarios. The animated 3D models can be updated very easily if changes are made to the original data. All that is required to view the 3D animations is an up-to-date version of Adobe Reader. Many machine and plant engineers still plan and document the assembly of their systems using the object in question – a time-consuming process. If they started assembly planning during the digital stage, they would be able to deliver their systems faster. The 3D PDF solution from PROSTEP allows them to plan the assembly steps at an earlier stage, based on the CAD models and using a large library of typical assembly operations, and to calculate assembly costs reliably. They can also animate embedded 3D models to illustrate specific assembly steps. Architectural firms and construction companies still primarily rely on drawing-based communication. A digital building model containing all the relevant building data would not only make planning and execution much easier but also the subsequent management of buildings. The 3D PDF solution from PROSTEP makes it possible for the companies and disciplines involved in the construction process to embed their building information in a 3D PDF container in a format that can be read by all those involved in the project and link them together so that the impact of any changes can be monitored more effectively. Finding the right spare or wear parts in a maintenance manual is time-consuming and prone to errors. Digital spare parts provisioning makes maintenance technicians' work easier and provides companies with an incentive for ordering spare parts directly from the manufacturer of their machines or systems. The 3D PDF solution from PROSTEP makes it possible for manufacturers to automatically create electronic spare parts catalogs that contain all the information relevant to service regardless of the system in which this information is stored. The solution also allows their customers to place their orders for parts from directly within the catalog. Although most companies today model their products in 3D, paper drawings are often still the primary documents for manufacturing, quality assurance and assembly. The end-to-end use of digital product models would reduce the time and effort required to create drawings and cut lead times. The 3D PDF solution from PROSTEP makes it possible for companies to communicate model-based manufacturing information and information relevant to quality and to view this information with Adobe Reader. If necessary, native CAD or STEP data can also be added to the 3D PDF containers. When dealing with requests for quotes, the staff in purchasing has to gather information from a variety of different source systems and record incoming quotes in order to evaluate them. A time-consuming process that could be speeded up considerably if requests for quotes (RfQ) were created automatically. The 3D PDF solution from PROSTEP simplifies the quoting process by merging all the information required to handle requests for quotes in a 3D PDF document at the click of a button. Suppliers can enter quoted prices and other information in interactive form fields that are automatically evaluated after the form is returned. Every company organizes its release and change processes somewhat differently, making it difficult to coordinate cross-enterprise development projects. More efficient communication of any information that is relevant to changes would significantly simplify and accelerate these processes. The 3D PDF solution from PROSTEP supports cross-enterprise coordination by making it possible to define intelligent PDF templates for change requests/notification of changes that are automatically filled with all the information relevant to changes. The recipients can automatically import this information into their backend systems. Companies not only create CAD models, 2D drawings and circuit diagrams but also a large number of technical documents in a variety of different formats. If it were possible to visualize them using a single tool, there would be no need to buy and maintain numerous converters and viewers. The 3D PDF technology from PROSTEP makes it possible to establish a uniform standard for viewing data from different applications. It also makes it easier to pass this data on to partners in the supply chain, who do not require any other viewer apart from the free Adobe Reader. Many companies offer customers the opportunity to configure the product of their dreams online, i.e. by selecting certain options, colors or materials. If they provided the customer-specific offers in digital form, customers could use them offline or share them with other people without having to print them out. The 3D PDF solution from PROSTEP makes it possible to merge all sales-related documents in an interactive 3D PDF document that customers can view with Adobe Reader. Interactive form fields and embedded business logic even allows them to trigger the order process directly from within the document. There are doubtless still numerous business processes in place at your company that are characterized by manual intervention and media discontinuities when transferring information. Would you like to make these processes more homogeneous by communicating the information in digital form? Then please contact us. We will develop a solution for digitalizing and automating your business processes that is tailored to meet your specific needs, based on 3D PDF technology and our process know-how. PROSTEP – the experts of choice for intelligent, 3D PDF-based processes. 3D PDF documents offer a virtually endless list of possible uses to companies in any industry. You will find several examples here. See for yourself. To ensure that all the contents of a PDF document – including 3D – are displayed correctly, the document must be opened in Adobe Reader (Version X or higher). The browser's (frequently default) preview function cannot display the 3D content of the PDF document. Download the latest version of Adobe Reader - free of charge. Make it easier to perform maintenance and repair work on complex products through the use of 3D animation and exploded views. Individual parts of the products can be highlighted for better understanding. Your service calls become even more efficient in combination with parts lists and automated order forms for spare parts. Use "intelligent" PDF documents for drawingless product documentation. This allows you to easily incorporate development data and other information in PDF documents. A PDF can for example include product manufacturing information (PMI) which can be used together with the 3D model directly in the manufacturing process. Provide your sales team with support in the form of documents that you create individually for your customers in a fully-automated process. They will appreciate the clear-cut presentation of the product, its configuration and its functionality, thanks to embedded animation or videos. Once a decision to buy has been made, a link in the PDF will take the customer directly to the price list or ordering process. Update lengthy, complex and paper-based change processes with the latest communication technologies. With 3D PDF, you provide your development partners and suppliers with a simple and easy to understand means of communication. This saves development time and money and helps to prevent errors in the early stages of development in particular. Build your digital documentation with ease using the tools provided with 3D PDF Pro. These 3D PDF manufacturing documents will give your enterprise an enormous amount of technical advantage as you are now able to communicate more effectively across departments and with your customers and vendors. Your proprietary information is well protected with the security built into the PDF document. Walk through step by step assembly and disassembly procedures for your model. Utilize the template’s Play Controls and Step Lists to add titles, caution notes, descriptions and specific part information to your 3D document. 3D Work Instructions also provides the ability to highlight parts as you lay out specific instructions for each step, all in an easy-to-view PDF format. Looking for the best solution to build out an informative and technical document, which not only captures your products information but also includes a rich interactive approach to displaying your project or model? With 3D PDF technology display a sleek and fully customizable template, which includes both your brand and any key technical information related to your 3D model, such as product features, specifications, notes, and more. Move away from 2D illustrations and multiple sheets of paper and provide users with an easy-to-follow 3D animated user guide. Looking for better way to showcase your product online or send to your customers and vendors? Embed a simplified 3D representation of your product to an electronic 3D PDF document. Allowing potential customers to freely navigate through your secured and presentable 3D visuals will increase product visibility for online viewing, buying and selling of your items. Use 3D PDF’s to really show your product capabilities. With secured 3D PDF documentation it is virtually impossible to steal proprietary information from your 3D data. Improve your work instruction documentations with 3D PDF electronic documentation. 3D PDF Pro can advanced your maintenance manuals, user instructions, operating instructions, service docs, installation guides and much more with 3D visibility. These set of tools enable you to create elaborate 3D animations along with step-by-step instructions, guidelines, tools and other requirements for each procedure. Your 3D data can also be locked down in a secured 3D PDF document to make it virtually impossible to steal proprietary information from your documentation. Create assembly and disassembly guides in 3D to reduce variations of user interpretation, increase quality and meet demands. You will also reduce pages and pages of illustration by combining views and instructions into one simple-to-use 3D PDF document. Not only will you enforce consistency, 3D PDF’s will improve quality and takt time. It is also a great training tool for new employees. With 3D PDF documentation, all your engineering specs and product information can now be stored in a single technical document. Keep all your engineering data and requirements in one location or integrate 3D engineering documents with your PLM or ERP system making it easier to communicate with all team members. These ISO standard 3D PDF documentations make data exchange much easier. Using 3D PDF’s as the new corporate standard viewer all team members will be able to share technical specs, design reviews. 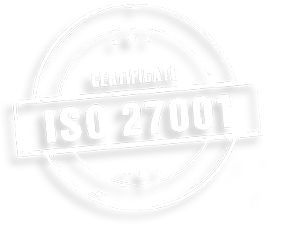 These manufacturing ISO documents will protect company proprietary information and make revision controls easier to manage throughout the development phase. PDF documents are a widely used standard portable document format that can be viewed and commented on for free using Adobe® Reader®. Secure these 3D PDF documents for email sharing or protect them within your companies ERP system. 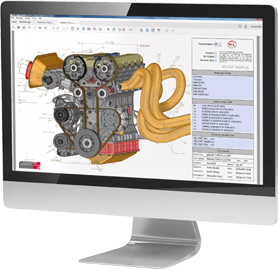 Using 3D PDF’s as the new corporate standard viewer for design reviews, share design details, technical information and requirements with your team. These manufacturing ISO documents will protect company proprietary information and make revision controls easier to manage throughout the development phase. You can control who views your information and for how long. Your proprietary engineering (3D CAD) data is managed and well protected with the security measures built in to the PDF documentation. Secure these 3D PDF documents for email sharing or protect them within your companies ERP system. Advanced your 3D PDF work instructions or assembly guide documentation with custom features making for a dynamic instructional guide. With these advanced 3D PDF templates, further customization can be done to meet requirements and be incorporated into your organizations ERP system. Data from multiple resources can be automatically integrated into the PDF document to reduce time and effort. Additional features such as audio instructions, callouts and customized functionality will further enhance your organizations technical documentation. Your 3D data is locked down in a secured 3D PDF document to make it virtually impossible to steal proprietary information from your documentation. Increase the quality of your product visuals or product information sheets with 3D interoperability. Enhance your educational material or training guides with 3D user manuals. Embed a 3D representation of your model into an electronic 3D PDF document, and add information associated with the individual parts of the 3D model. Users will be able to freely navigate and interact with the model and learn about the different components. Move away from 2D illustrations and screenshots along with multiple sheets of paper and provide users with an easy-to-follow 3D animated user guide. Together we are stronger. As a customer of PROSTEP AG, you benefit not only from our extensive network of technology, sales and service partners but also from our stake in companies that neatly round off the range of solutions we offer. As a member of numerous organizations, we have a finger on the pulse of technology and actively participate in key research and development projects, particularly in the field of standardization. Synergies bundle knowledge. And knowledge provides solutions. We have long maintained open relationships with all IT system vendors to ensure that we are able to offer our customers the best possible solution. We maintain strategic partnerships with leading CAx and PLM vendors. Our sales partners expand their offering to include PROSTEP products and services. These specialists provide companies from a wide variety of different branches of industry with professional advice and support. Our sales partners include companies from around the world. SEAL Systems AG is PROSTEP'S sales partner for PDF Generator 3D in Germany, Austria and Switzerland. Smartscape, Inc. is PROSTEP'S sales partner for PDF Generator 3D in Asia. Tetra 4D LLC is PROSTEP'S sales partner for PDF Generator 3D in North America. PROSTEP AG is always in tune with the times and is actively involved in shaping new developments. The 3D PDF Consortium comprises Adobe, Tetra 4D, Tech Soft 3D, PROSTEP and other companies. The organization is committed to the further development of the PDF/E and PRC standards. The research association Smart Engineering e.V. promotes science, research and education in the field of smart engineering. The aim of the association is to support the development of intelligent products and services as well as networked production and the corresponding production systems over the entire product lifecycle and to enable end-to-end digital value creation. NAFEMS, the National Agency for Finite Element Methods and Standards, is a non-profit organization that promotes the safe and reliable application of simulation methods. The OMG consortium (Object Management Group, Inc.) develops internationally recognized standards for manufacturer-independent and cross-system object-oriented programming. The prostep ivip Association develops innovative approaches to solving problems and modern standards for product data management and virtual product creation. The Gesellschaft für Technische Kommunikation e.V. (tekom) is the German professional association for technical communication and information development. The Bundesverband IT-Sicherheit e.V. (TeleTrusT) is competence network that includes domestic and foreign members from industry, administration, consulting and science as well as related partner organizations. The Verband Deutscher Maschinen- und Anlagenbau e.V. (VDMA) is an industrial association that represents the interests of Germany's capital goods industry. It speaks for approximately 3,000 primarily small and medium-sized companies. Wissenschaftliche Gesellschaft für Produktentwicklung (WiGeP), a product of the merger between Berliner Kreis and WGMK, is a competence network for promoting product innovations in the mechanical engineering and related industries. The KVD Kundendienst-Verband Deutschland e.V. is a German customer service association.